Early c. 1910 postcard view of a Zodiac airship manufactured in France. The Zodiac Dirigible Airship Company was a business venture started by Rhode Island businessman Stuart Davis in 1910. The idea was to establish an airship ferry service between Hazard’s Beach in Newport and Scarborough Beach in Narragansett, a distance of about eleven miles. The city of Newport is located on the east side of Narragansett Bay, and the town of Narragansett is on the western shore. In the early 1900s the only way to cross Narragansett Bay was by boat, for the Jamestown and Newport bridges did not exist. The new airship company was incorporated to serve the needs of wealthy citizens who might wish to travel across Narragansett Bay by air rather than by boat. The famous Narragansett Pier, located not far from Scarborough Beach, was a very popular resort area for the wealthy at that time, especially during the summer season. Another popular destination was the now defunct Rocky Point Park, located on Narragansett Bay in Warwick, R.I. It was also anticipated that excursions could be made to that destination as well. The name Zodiac Dirigible Balloon Company was derived from the Zodiac balloons then being produced in France. The Rhode Island company was incorporated in New York City. Mr. Davis announced his plans for an airship ferry service in June of 1910 which was exciting news for Rhode Island’s summer colonies. On July 4th, Davis’s first Zodiac balloon arrived in New York from France aboard the steamship George Washington. From there it was brought to Rhode Island to be assembled. When completed, the airship would be 100 feet long, contain about 20,000 cubic feet of gas, and capable of carrying up to six passengers. Being a dirigible meant that the balloon had no interior metal framework like a Zeppelin. Therefore it would only fly on calm days. 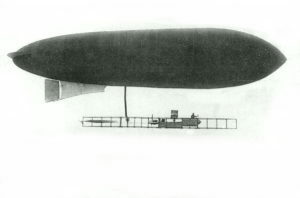 The trip between Narragansett and Newport was estimated to take about an hour or less, and it was anticipated that the airship would make three or four trips per day. While no rate fees had yet been established, it was reported that it would cost about five-hundred dollars to charter the aircraft for an entire afternoon – a great deal of money for the time. Davis hoped that flight operations would begin by August, but in the meantime preparations for housing the airship were being made at Scarborough where the company’s Rhode Island headquarters would be located. The San Francisco Call reported on July 6th that the structure presently under construction would be 112 feet long, 42 feet wide, and 50 feet high. When completed, it would reportedly be the first (commercial) airship station in America. If successful, Davis’s venture would also be the first commercial airline in the country. Plans for a second station in Newport were also underway. On July 31st, Davis’s airship, the Zodiac IV, as it was now named, arrived in Narragansett to begin making test flights. It was further reported that a second airship, the Zodiac III, was expected to arrive within the next seven to ten days and it too would begin test flights. Once the test flights were completed the airship(s) would begin passenger service. Unfortunately, the test flights did not go well, and the whole venture was scrapped. History Bytes: Airships In Newport, Newport Historical Society, R.I.